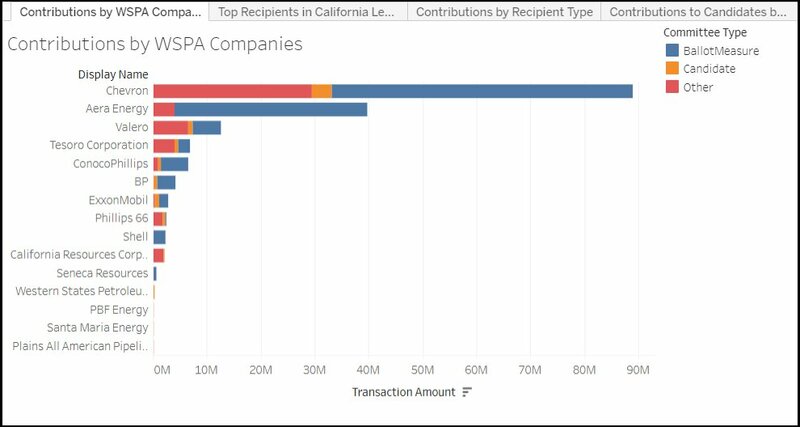 The Western States Petroleum Association (WSPA), the most powerful corporate lobbying group in California, and its members have contributed $170 million to California political campaigns since 2001, according to a new data analysis from MapLight released on February 14. Senator Jean Fuller, the Kern County Republican from Senate District 16 who has served as the Legislature’s most fervent advocate for Big Oil, received the most oil industry contributions of any legislator, $88,890. Senator Cathleen Galgiani, a Democrat from Senate District 5, received the second largest amount of oil industry contributions, $83,350. Assemlymember Rudy Salas Jr., a Democrat from Assembly District 32, received the third largest amount of Big Oil money, $79,850. Big Oil dominated three out of the four top spots of expenditures by all lobbying organizations in 2017, according to documents from the California Secretary of State’s Office that I analyzed. Big Oil has become so powerful in California, in spite of the state’s largely undeserved “green” image, that every bill except one opposed by the oil industry has failed to make it out of the legislature over the past three years. But WSPA and Big Oil wield their money and power not just through spending millions of dollars on lobbying and political campaigns. They also create Astroturf groups, work in collaboration with the media, and get appointed to positions on and influence key regulatory panels. As Reheis-Boyd was overseeing the crafting of California’s “marine protected areas,” Reheis-Boyd’s husband, James D. Boyd, sat on on the California Energy Commission from 2002 to 2012, including serving as Vice-Chair of the Commission from 2/2007 to 1/2012. The “marine protected areas” created under the privately funded MLPA Initiative fail to protect the ocean from fracking, offshore drilling, pollution, military testing and all human impacts other than fishing and gathering. Yet state officials and corporate environmental NGO representatives praised the process overseen by Reheis-Boyd and other corporate interests as “open, transparent and inclusive,” though it was anything but. No Comment to " Western States Petroleum Association & Members Have Dumped $170 Million Into CA Campaigns Since 2001 "